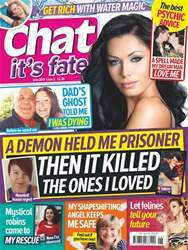 (1 Customer Reviews) | Write Review 13 issues per year Chat it’s fate is the leading psychic magazine everyone trusts. No other publication has the content and variety of our paranormal true life stories, which make readers gasp in awe but, believe us, every word is true. Our 13 columnists are Britain’s foremost psychics and they solve problems on anything from love, past lives, to dreams and spirit guides. They have helped thousands and guide readers on their psychic path. Other features are positively mind-expanding as they explore every single possible spiritual dimension. We are the perfect medium for the lovers of the paranormal. 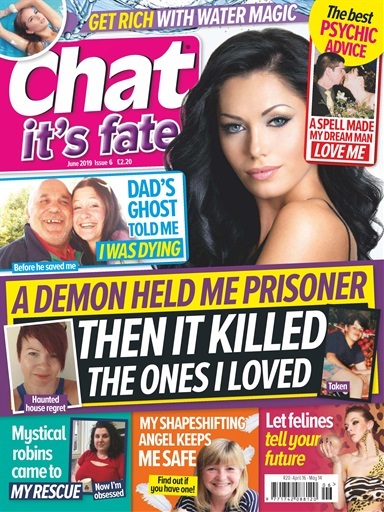 Chat it’s fate is the leading psychic magazine everyone trusts. No other publication has the content and variety of our paranormal true life stories, which make readers gasp in awe but, believe us, every word is true. You'll receive 13 issues during a 1 year Chat Its Fate magazine subscription. You'll receive 13 issues during a 1 year Chat Its Fate magazine print subscription.